Considering that I was in a monastery the day began very late. I was awake at 5 am, but slumbered on and off until roughly 8 am. The weather was fantastic, the sky a deep blue and the view stunning. Not a bad place to build a monastery for sure. Hard to get to, but that is the point I guess. Kalist needed to do a lot of clean up work as it was a big day for the monastery. A commission from Skopje, the capital, was expected and he needed to show them that this place is worth putting money into. 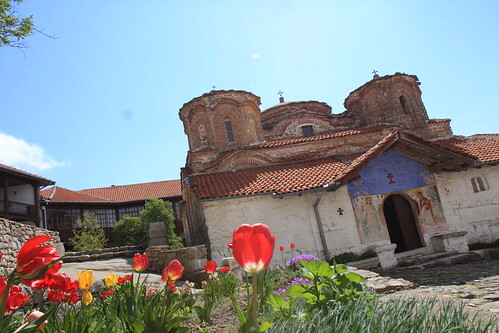 But despite this and the clean-up from Orthodox Easter celebrations happening a couple of days before, Kalist and I talked for a good hour and a half and I am grateful to him for having taken the time to do so. We touched so many topics that it is hard to summarize our conversation, but I thoroughly enjoyed our conversation, ranging from politics (mainly involving Greece) and the need to restore the church as the centerpiece of the monastery. I was also interested in his take on the increasing number of people (me being one of them and lucky enough to be the only one that day) that came to the monastery. His answer was rather straightforward: he doesn’t mind the increasing number of people, but it will change how he interacts with them – the tea were enjoying would no longer be possible. And that would be a loss for everyone going up. Kalist was a major part in what made this place special to me. As he is so busy during the summer months, one of his statements struck me as particularly poignant. “In the winter months, when the snow is so high that you can not leave this place, I can try to be a monk.”He also spoke about the relationship with Greece, a recurrent theme with everyone that you enter into a conversation. Apparently the day before, Greece had blocked the air traffic from Macedonia Air Transport, arguably because of the name of the carrier. This was enraging people quite a bit as they feel that they are doing whatever is necessary to settle things, but they are getting the short end of the stick. Eventually it was time to leave and I headed down the mountain on a different track. After some unintended bouldering, I was back on the main trail and headed to San Marco, a little detour. 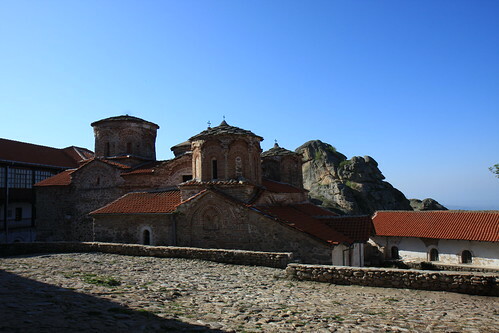 Back to Prilep and Bitola it was. 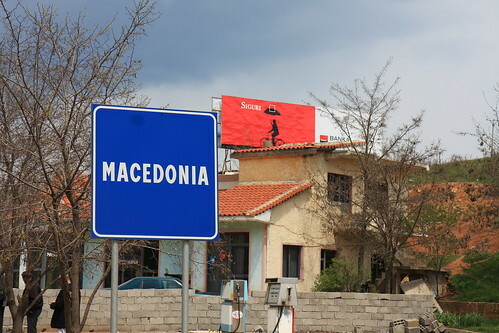 I didn’t leave the place until 4 pm, as Elena, working in the tourist information office, and I chatted about this and that (including politics and especially Greece again, but also on tensions between Albanians and Macedonians within Macedonia). I asked some sheep farmers (major dogs on the way to get to them) whether I could pitch my tent somewhere and things were difficult for a while, then I finally got the point across that I had a tent with me and they just said to find a good spot. Pretty heavy winds and no flat spots eventually led me to an unused garage in the middle of nowhere, which seemed cosy enough. So, I am now in the Former Independent City States of Athens, Sparta, Thessaloniki and Mykonos. I am also happy to say that two newspaper articles appeared in Croatia (thanks Sveto for sending the link) and Montenegro (thanks Sven for sending this one) and needless to say I can only hope that they say good things about the tour. Moreover, more pics are as always on the flickr page. I woke up to a beautiful morning, blue sky, almost no clouds and soon set out to do the last bit of climbing. After reaching the pass, it was downhill for a few km and it could have been great if not for the strange cracks in the road. At one point I looked up and thought I had seen a snow-covered mountain. Looking up again it was gone. I wasn’t in a desert yet … it was to appear later again and I would ride along its flanks for quite a while. I finally decided to replace the other screw on the rear rack. Just as the other side, the threading had given up quickly … too quickly if you ask me. Bad quality I will say again. I asked in a town and the local car place didn’t have anything, but one of the guys started yelling to someone else who would bring me to another person. A seriously big guy, who would first bring out a short stubby screw (too short), then a thicker one (too thick) and eventually plunk himself on his scooter only to appear again 10 minutes later with a perfectly fitting screw. 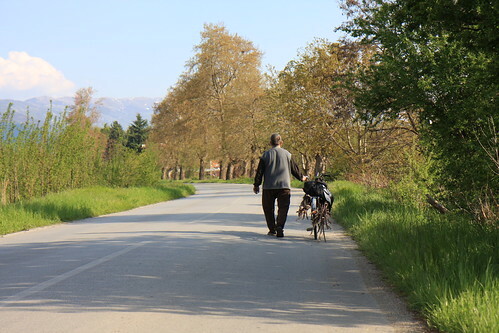 I talked to his son in the meantime who gave me directions and told me that there would be a climb coming up before getting to Bitola. I asked what I owed them, they would hear nothing of it. Almost there we thought and we ask the next sheepfarmer, he gives directions. The Lonely Planet says to go into the village of Dabnica, so I tell the driver to head there. It was all bunk … We ask in the non-existing village and sure enough happen upon Josko who again speaks perfect German. He too is a sheepfarmer and is tending to some cows as well. He makes short shrift of things, puts himself in the taxi, says to go back a bit and gives me perfect directions. Look at this stone, go there and hang a left. Not that it would have been all that necessary given that I soon stumbled upon a pedestrian highway practically. If you have the LP, forget about what it says. 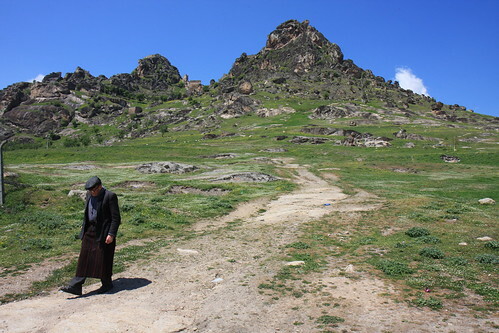 Don’t go to the village, if you see church to your right, go back 500m and head up the mountain which is on your right as you head down the valley. 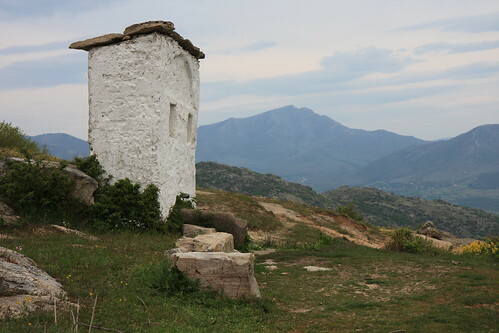 You should see the monastery and a white stone above you. Head for that stone, then hang a left. It’s simple really. The climb isn’t really hard and extremely fun. Haven’t seen the dinosaurs that the LP refers to, but hey … they can’t always be right. 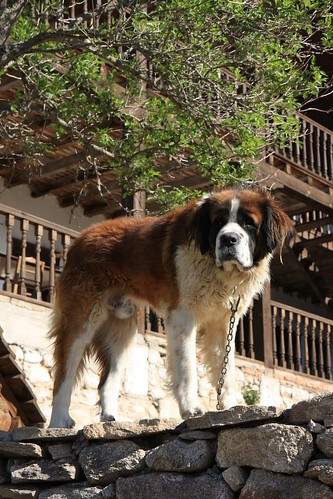 I arrive at the monastery soon enough, greeted by the big St. Bernard and there are only three people there. It turned out to be much bigger than what it looks like from beneath. The only monk in this quite good-size place, and an elderly woman and a young man as very temporary caretakers. The monk is a humorous guy and when I ask him whether this isn’t a large place for essentially one person, he says “I’m a big man!” with a resounding laugh. Our whole conversation is great and his English amazing. We also have a common acquaintance as it turns out, he is friends with Antonio (this will mean something to only a couple of people). I spend the night at the monastery in a wonderfully peaceful and quiet environment. It was a long night, I slept for over 9 hours after a hard day of riding and not much sleep the night before. I bid my farewells after a hearty breakfast with the family and set out. More winding road and then an uphill to get to Macedonia. The type of mother-of-an-uphill. You turn the corner and you see it and it’s the I don’t like it kind of uphill. Switchbacks alright, but steep ones. Lots of traffic. It was 45 minutes of work, grades being mostly in the double digits. Good fun though once you’re up. The views were amazing. Then it was time to say goodbye to Albania. I hope I’ll be back some day. I had been treated so well and the bad rep is not deserved as far as I am concerned. Maybe I was lucky. Could be. But the people I did meet were extremely open and forthcoming, even if they didn’t have much. Try to give something tangible back and it’s hard to do. 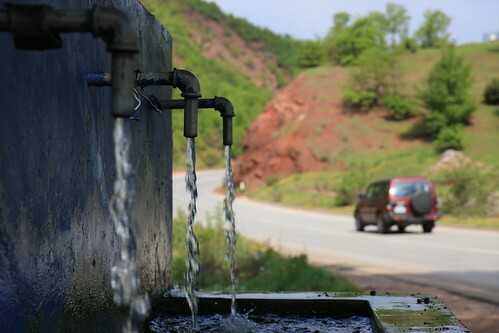 Macedonia greeted me with a downhill, rain and 10 degrees lower temperatures. 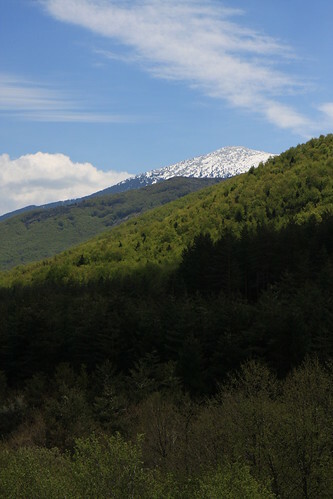 I was now at 1000m altitude but while warm on the Albanian side still, it was freezing in Maceonia. 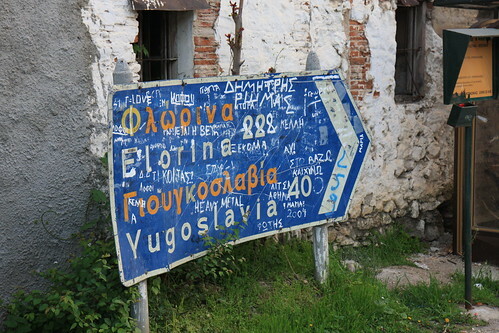 It soon cleared up and I arrived in Struga, the first town on Lake Ohrid. I was lucky again. I stopped to ask directions for an internet cafe - not knowing that I would have seen many had I continued just a bit more. The store owner said to continue on when Jetmir came around the corner and the store owner said something in Albanian (both are ethnic Albanians) and for the next few hours Jetmir and I talked about everything imaginable. I changed money, hopped on the web and we had a bite to eat. He beat me to paying and wouldn’t hear anything when I protested. He had been an exchange student in the US a couple of years ago. 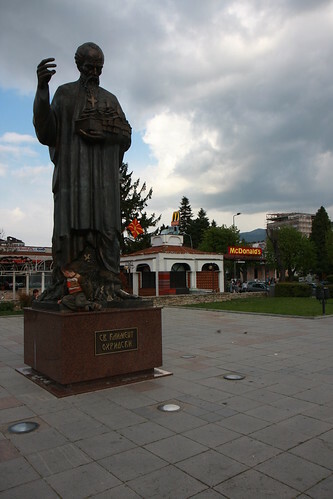 Things in Macedonia make a lot more sense to me afterwards (as much as they can), politics and religion included. Jetmir happens to not care about ethnic lines in a country where this is the norm more than the exception. Schools are divided, sometimes being used by one group in the morning, by the other in the afternoon. Macedonians in Struga protested to have a separate school by not showing up for class for a month. Flags are burned, the situation seems to be a bit ugly at times. But I found his stance to be admirable given the situation at the moment. 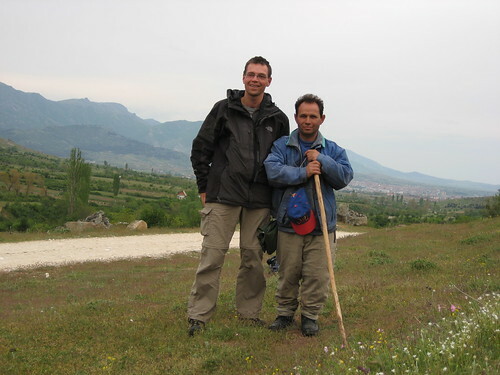 We walked towards Ohrid, which was not his direction at all and continued our conversation. Jetmir, all the best to you. 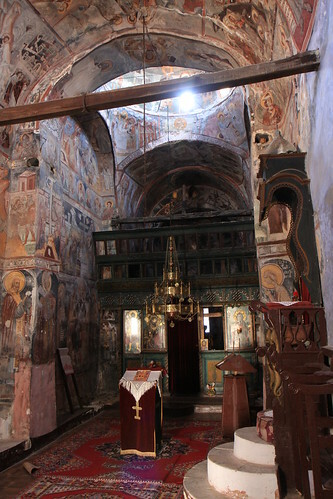 Finished the day off by visiting Ohrid, left when I saw this …. and continued on for another 20km or so finding a peaceful spot near a little stream to have dinner and turn in for the night. The ride was perfect with the sun throwing a gold glow on the surrounding hillsides and the forest I was pedaling through.